So, you buy a bell pepper for a recipe. If you're cooking a dish for four or six people, you probably use it all. But when you're cooking for two, chances are good you only use a quarter of it. Into the fridge it goes. You keep thinking you'll use the rest of it, but before you get to it, it's gone squishy. Don't let your peppers go squishy. Here are all kinds of ideas for using the other half of that pepper. Or the other half of the bag you couldn't resist buying. Note: The flavor of red and green peppers are somewhat different — red peppers are sweeter (they're fully ripe, after all), while green peppers are more assertive and vegetal. Yellow or orange peppers are more similar in flavor to red peppers and can also be used in many of these recipes (they're not very attractive when roasted but are still delicious). When bell peppers are on sale, it's always tempting to buy a bagful. Now what? 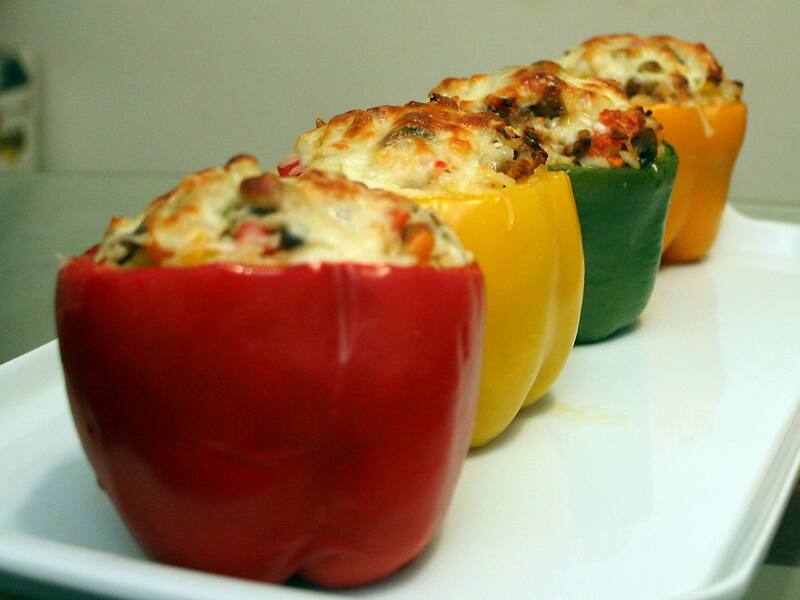 Stuffed peppers, either filled with a spicy mixture of Italian sausage and rice, or a vegetarian version with mushrooms and cheese, are a delicious way to use either red or green peppers. And since they freeze well, why not make a double (or triple) batch for future dinners? A great way to extend the life of peppers when you've been over-enthusiastic at the market is to roast them. While red peppers are most often roasted, green peppers also benefit from the same treatment. They're easy to prepare either under the broiler or over a gas flame, and once roasted and peeled, they freeze beautifully. Pull them out and use them in salads, soup, quiche, or even salsa. Many cuisines use red or green peppers in ​stir-fry dishes or other saute recipes. Chinese pepper steak, the traditional Chinese-American staple, uses both, as do many fried rice dishes. And even when not specified in the ingredient list, peppers can often be a great addition to many Asian recipes. Mexican-inspired and Southwestern dishes are also often enhanced by the addition of peppers — try them sauteed with onions and added to steak tacos. And don't forget the "trinity" of onion, celery, and bell pepper that's the starting point of so many Cajun recipes. Used raw, bell peppers add color and crunch to all kinds of dishes in a variety of cuisines. Some people have trouble digesting raw green bell peppers, so if you're in this group, use red bells for these recipes. Consider a corn and avocado salsa or a tangy ginger slaw.